On Monday, a friend of mine invited me over to her brand new home that she just purchased with her husband. As they’re fixing it up, she generously gave me the chance to look at and purchase some furniture pieces that were in the house that they didn’t want. Out of all the diamonds in the rough that would look fabulous with a paint makeover, I chose this vintage mahogany music cabinet. This piece came to me with mildew on the inside, lots of mis-matched shelves and a back panel that was falling off. My first step was to take it completely apart. I removed the back panel and took the door off its hinges. Then, Marc helped me unscrew the brackets that were holding all of the shelves up. We took them all out and I saved the two that were in the best shape. The rest were discarded. 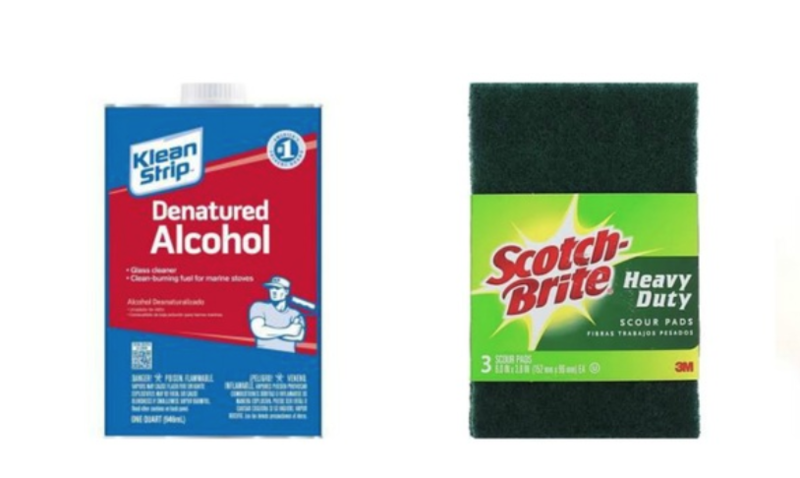 I gave everything a thorough cleaning with a 50/50 mix of denatured alcohol and water, scrubbing it all with a green Scotch Brite pad as I went. Then, I scuffed everything with 400 grit sandpaper. This scuffing isn’t nearly as thorough as I would have done if I was going to be following up with Miss Mustard Seed’s Milk Paint. This scuffing was a quick once-over to remove any remaining surface contaminants. After everything was clean, I started sprucing up the inside of the cabinet. Using a foam brush, I applied General Finishes Java Gel Stain right over the existing finish and wiped away the excess. This did a few things. First, it toned down the original red mahogany stain and made it a bit darker. Secondly, the Java Gel Staindarkened scratches that had occurred in the past, blending them in so they were less noticeable. Finally, it made the interior look much richer and deeper. I gave this treatment to the two shelves I was keeping, the interior and the inside of the door. Once the gel stain dried, I sealed it with two coats of High Performance Topcoat in Satin. 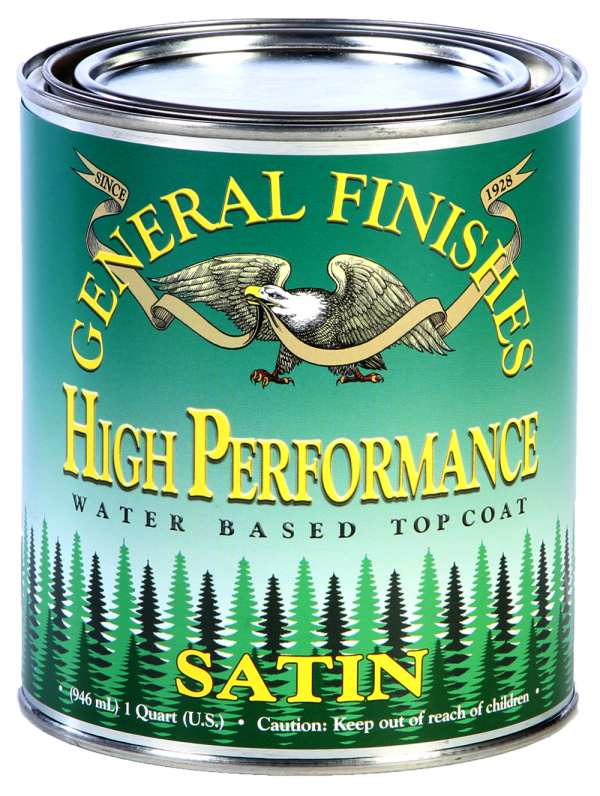 Whenever you are applying General Finishes Gel Stain to a surface, you always need to seal it. Gel stains are highly pigmented and need to be sealed so the color doesn’t leach out onto other surfaces. 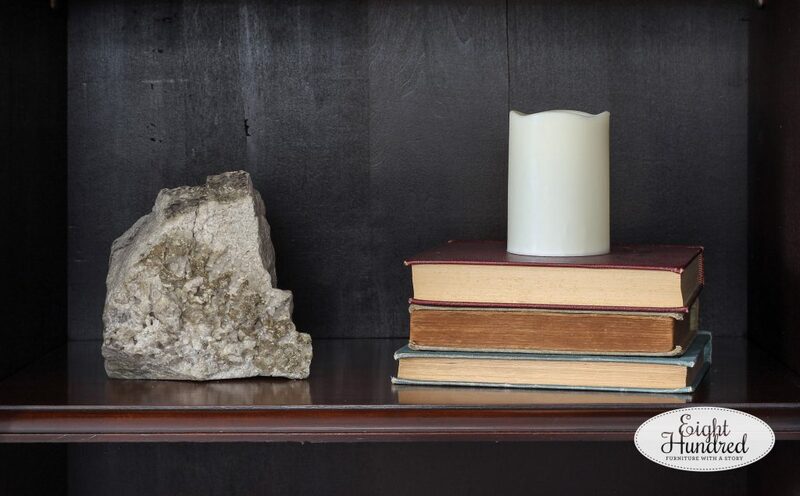 These layers of High Performance Topcoat will protect the shelves from scratches and hold up to high traffic use once completely cured. The door still has the mahogany grain of the veneer showing and I saved the original label on the bottom. 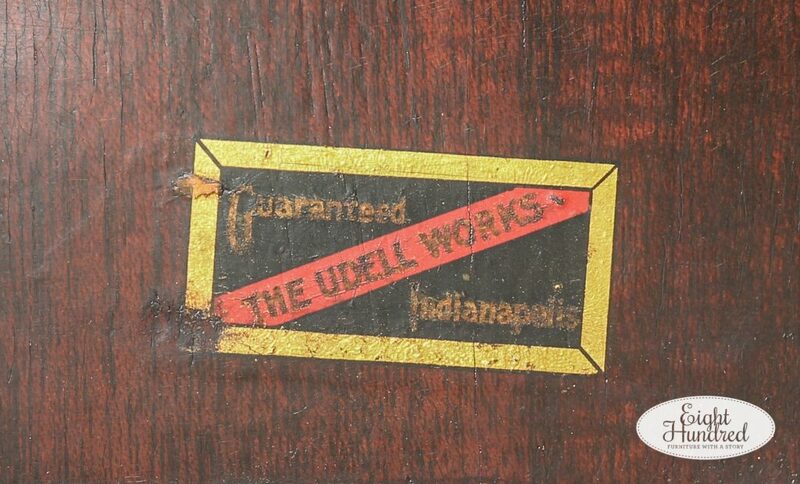 I did a quick Google search for The Udell Works in Indianapolis, but I didn’t find much on the company. Apparently several other folks had the same findings because there were multiple Google entries from people asking for information. 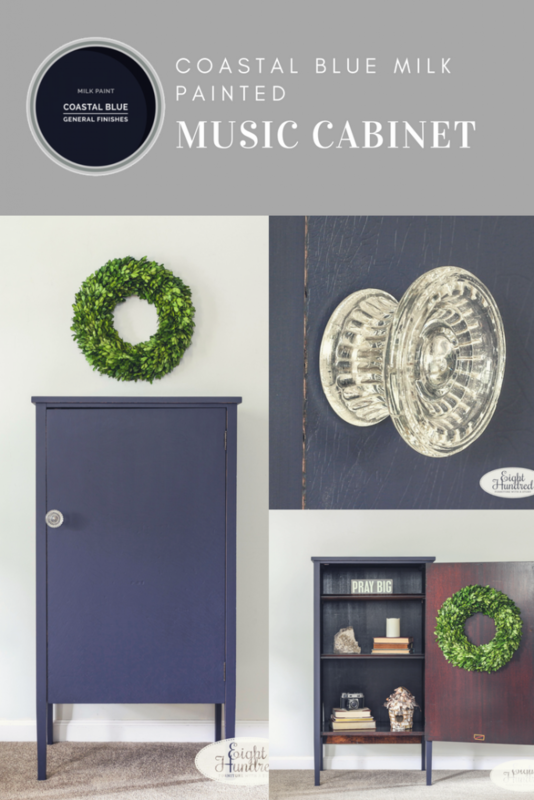 This cute little music cabinet originally held sheet music, but you could use it for any number of uses – books, linens, knick-knacks, toiletries, etc. It’s a great size too! The door originally had a key mechanism, but there wasn’t a key that came with it. 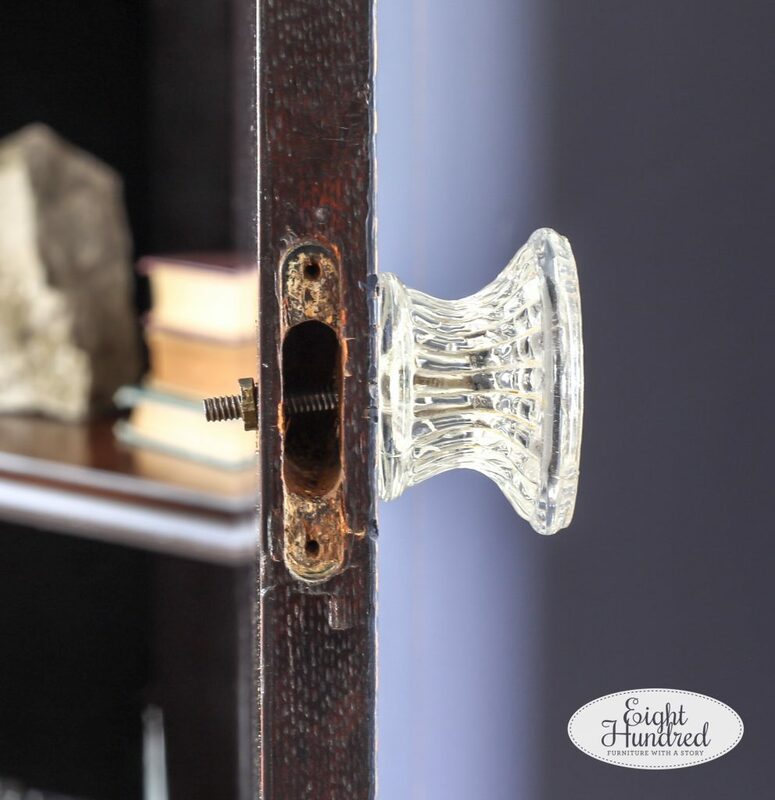 Rather than search for one, I simply removed the key hole and replaced it with a glass knob from my stash. You can see the original crackling of the oil based finish on the outside of the door in these two photos. 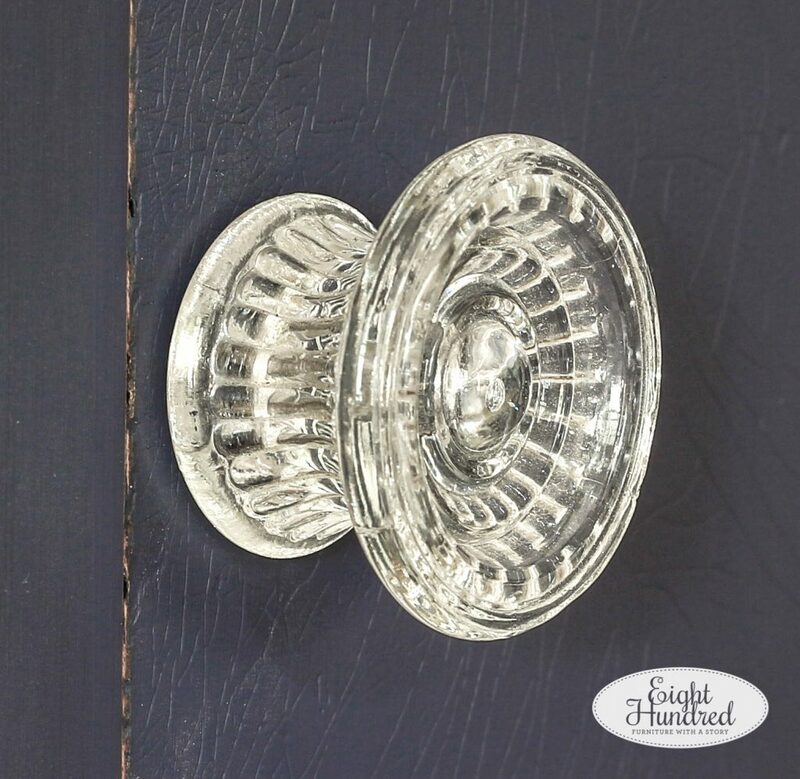 To remove the mechanism, I unscrewed the two screws that were holding it in place and wedged a screwdriver underneath the plate that was facing the edge of the door. Then it was simply a matter of wiggling it out. Once it was free and the years of dust were removed, I drilled a hole straight through the door and installed my knob. 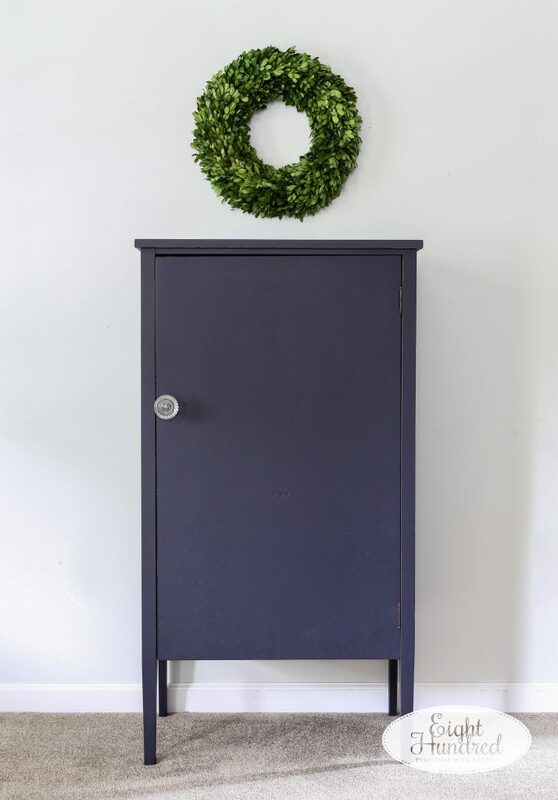 I settled on one of my favorite shades of navy when it came to painting this piece –Coastal Blue by General Finishes. Mahogany stained furniture is famous for bleeding through light colors of paint, and I would have needed to prime or shellac the outside if I wanted to go in that direction. Because I wasn’t up to the extra work (because even I get weary of painting from time to time), I settled on a dark color that wouldn’t show bleed through. 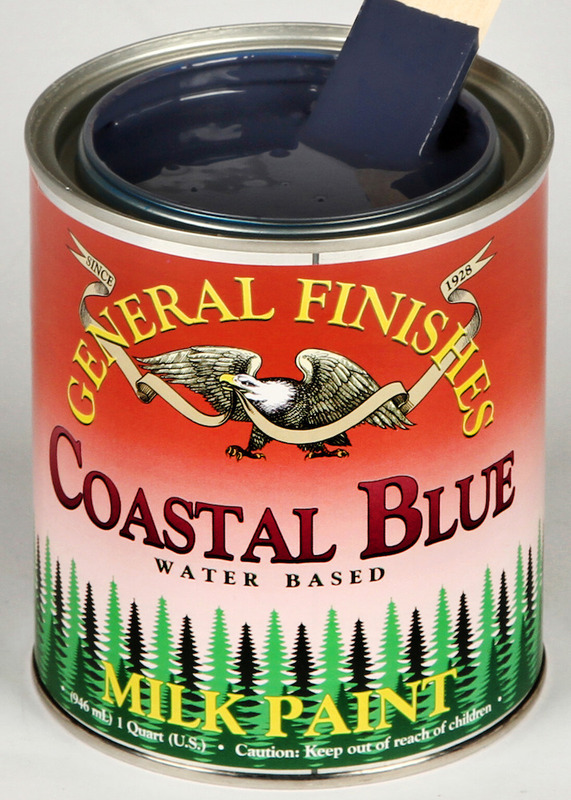 I did not apply a sealer because General Finishes Milk Paint is a premium interior/exterior mineral based paint that is so durable it does not require a topcoat unless you want to increase the sheen. 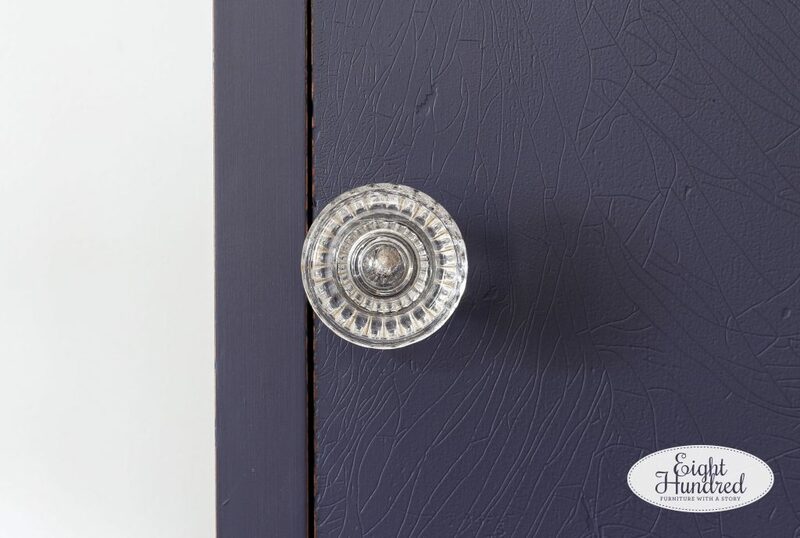 Now if you were painting kitchen cabinets or a table top, then a topcoat is required. 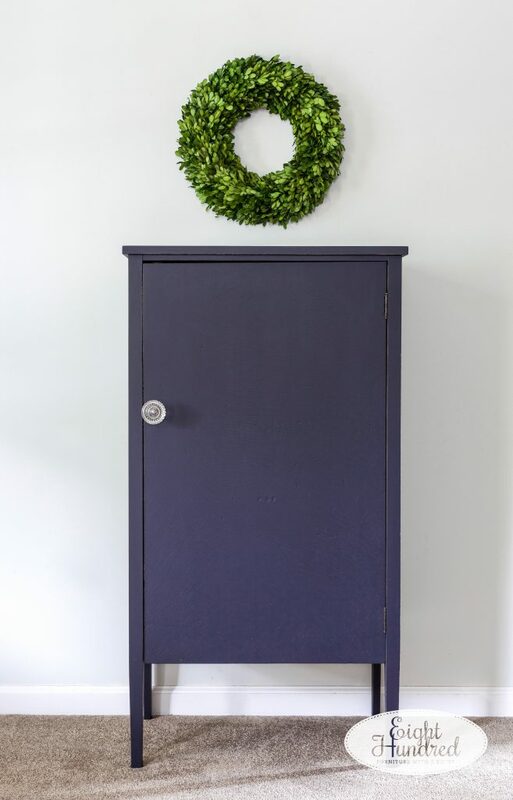 This cabinet won’t see much wear and tear on the outside, so after the GF Milk Paint has cured (20-30 days), it will be able to hold up to low-medium use. The real traffic will occur on the interior shelves, which is why they were sealed with High Performance Topcoat. 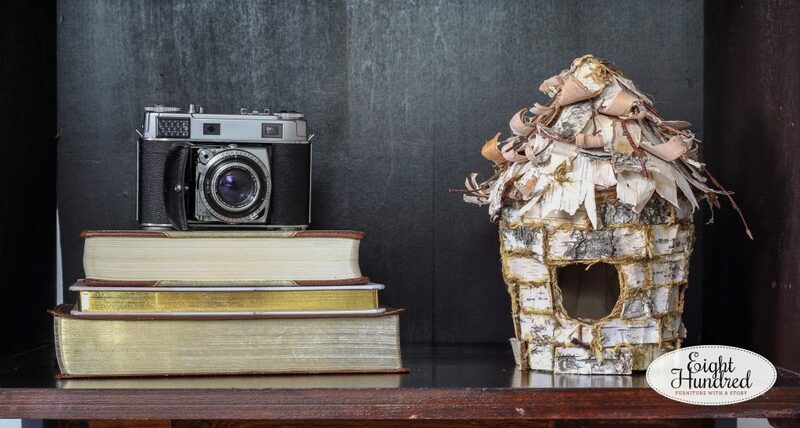 This piece will be making its way to my room at Homestead Studios this afternoon. It will be available for $175 plus tax and it measures 24.75″ wide, 16.5″ deep and 46″ tall. 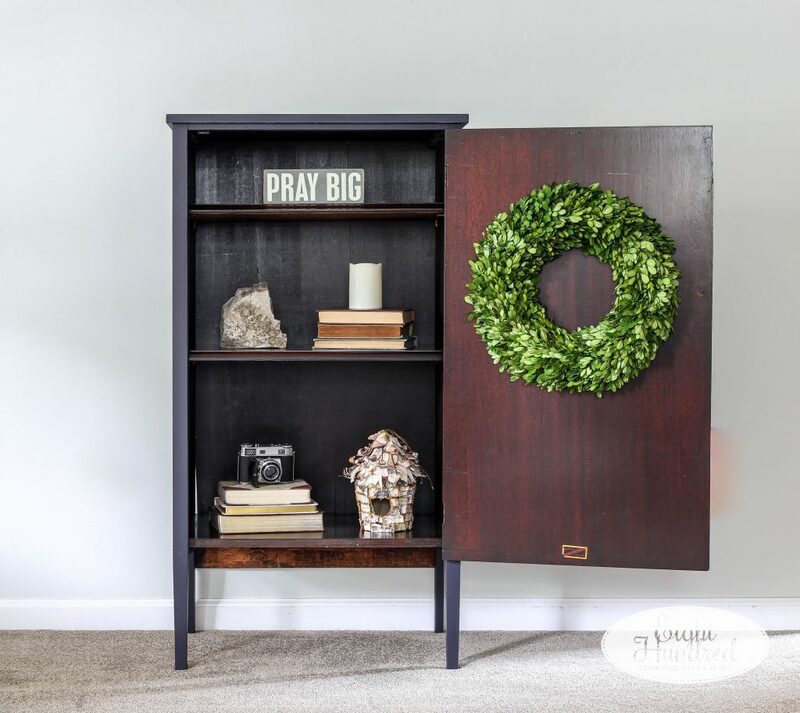 If you like this look and want to replicate it on a project of your own, you can shop for General Finishes products in my displays at Morgantown Market andHomestead Studios. Or, if you’re not local, I can always ship product to you. I’m also going to be holding several General Finishes demonstrations in the coming month or so. Check my Upcoming Events portion of my website to see when they are!